The Simba mattress contains 2,500 pocket springs and has the luxurious memory foam feel as you lay down onto it. I wrote last time when I reviewed the king size that it completely supports your body whilst you sleep with 'five luxurious layers designed to fit you and help you get the quality of sleep you've been dreaming'. I knew if the early mornings were going to continue then I needed to have the same comfort from my bed to his instead of laying on that bloody floor anymore! It’s ruined my back and I’m walking like a ninety-year-old after just one night on that floor. I still can’t believe a mattress fits all rolled up in the infamous Simba box so neatly either. The minute he saw the box he knew what was inside, only this time it was for him! His new bed frame, sheets, duvet and pillow had all been delivered, washed and ready. We just needed to put the bed together and then it was time to open the Simba box and see the magic happen. He absolutely loved opening the bag and seeing the mattress just expand right in front of his eye! Once it was fully open and ‘settled’ you couldn’t get him off it! 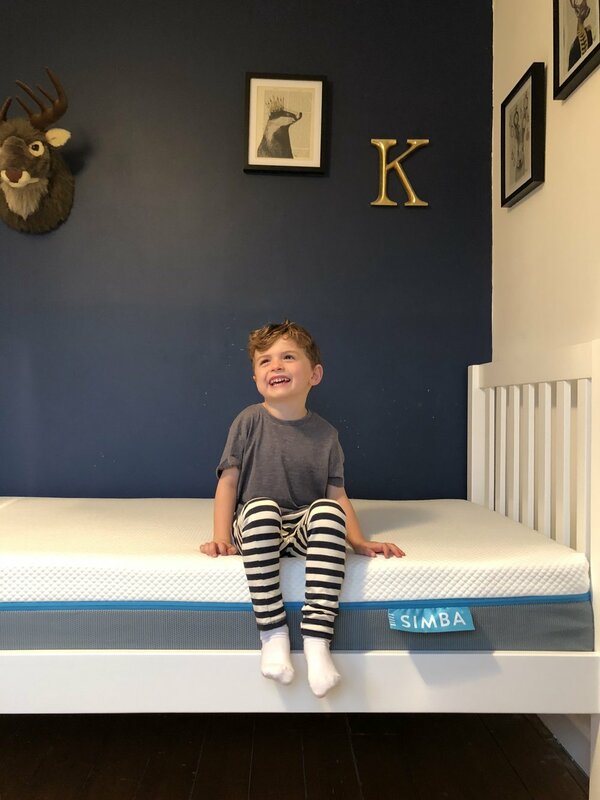 We’ve had our own Simba mattress a few months now (read my review here) and I can safely say it’s the best, most comfortable nights sleep I’ve had and i’m excited to see if it has the same effect on Kai. He’ll be so comfortable that he’ll sleep in? Can you imagine?! I won’t count on it though. I have found previous mattresses would get lumpy, springy and just uncomfortable over time. You’d get in it and feel yourself roll to one side or your partner would get in and you’d feel it. it just isn’t the case with the Simba. And I actually think this will last Kai a long time now. He has a single bed now which will do him for a few good years yet. I have purposely waited a couple of nights to see how Kai got on before writing this, and so far so good. He’s happy, he loves his new bed and I feel he just has all that extra room to allow him to spread himself out and I honestly think this will be a mattress we’ll have for many years before he’ll need another one. He has been saying “NO!! No adults allowed!” when I get in the bed, which is lovely… But he hasn’t thrown me out at 5am when he wakes up (still). But do you know what? I don’t actually mind. Before, I would not look forward to the early wake up (what am I saying? I’ll never look forward to them). The sheer uncomfortable-ness of the floor filled me dread. However the last couple days i’ve got in bed with him and we’ve fallen back to sleep together and it’s been lovely. 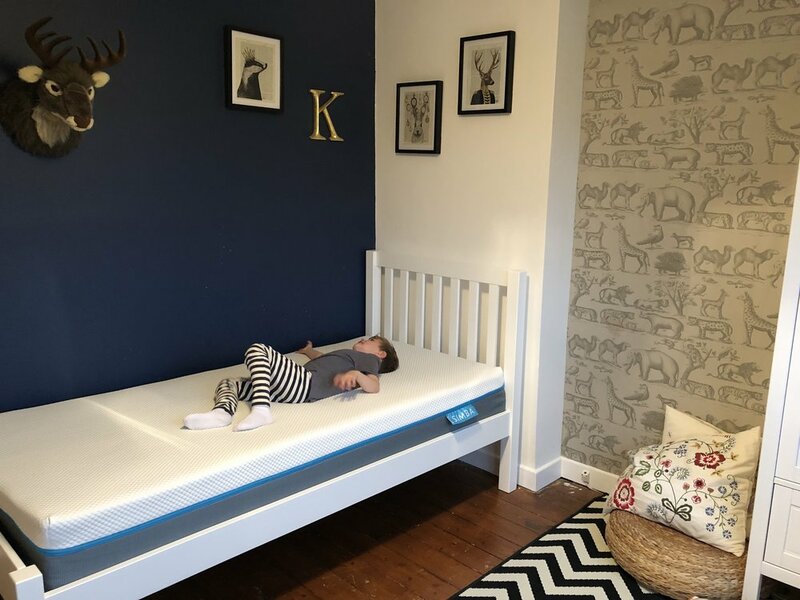 So where the mattress may not come with magic powers to keep children asleep til 7am… it certainly has helped this dad get a more comfortable sleep when having to jump in bed with his kid at 5am! If you’re reading this and thinking those few precious hours you actually get in bed these days could do with being a little more luxurious and comfortable then you're in luck! I am part of the Simba affiliate program which means readers of the blog can currently get £75 off their first order (when spending £349 and over). Just follow this link to get claim your discount!